So yesterday I noticed we had a few over-ripe bananas in the fruit bowl, and I decided I wanted to make something new, rather than my fail safe Banana Muffins. And so I did a search and found a recipe for Hummingbird Cake. Perfect, I thought, I only needed to buy the crushed pineapple and some cream cheese. 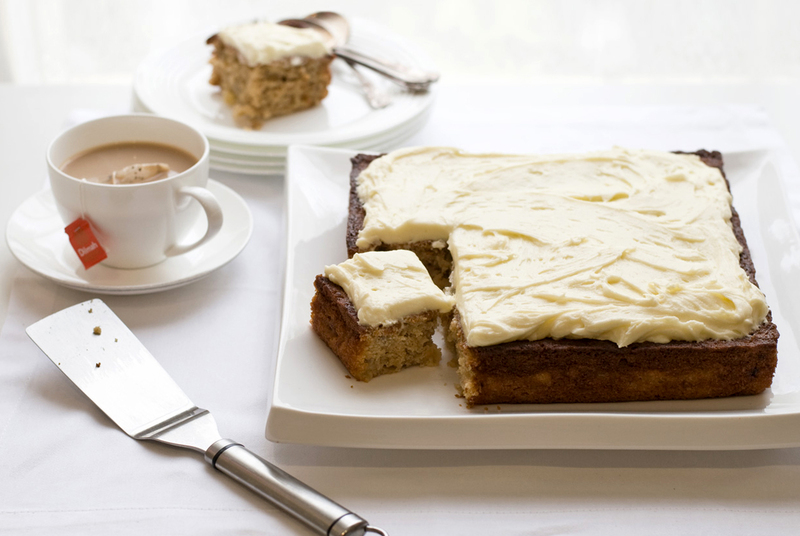 It’s a pretty simple recipe, great to whip up for afternoon tea or to use up any extra bananas. Preheat oven to 170°C. Grease and line the base of a 23cm square cake pan. Sift flour and spices into a large bowl. Add sugar, and coconut and stir until well combined. Add pineapple and juice, banana, eggs and oil. Stir until just combined. Spread into lined pan and bake for 40-50 minutes or until a skewer inserted into the centre comes out clean. Place on a rack and set aside to cool. To make icing, place cheese, butter, vanilla and icing sugar in an electric mixer and beat until smooth. Spread on top of cooled cake. Garnish with walnuts, if desired (I’m not a fan of nuts in cake so I left these out). I believe every household has an ounce or two of ripe bananas somewhere in the kitchen…This is the perfect recipe! I am happy to know that this includes pineapple too, which is a very good gift to our digestive tract. Thanks for the post. I’ll have a hummingbird treat in a few hours…Why the name, by the way? Oh I didn’t know that about pineapple! Thanks for the tip! It’s not known why it’s called a “hummingbird cake” – apparently the first time it was published, the author gave no explanation to the name.. Thanks 🙂 Yes, it is a very moist cake I think thanks to the bananas and the oil – the original recipe I used called for a cup but I thought that would be too much! Thanks Purabi 🙂 I love curries so I am going to have fun reading your blog too! Is this the recipe from the Hummingbird Bakery? No it’s not sorry, just one I found from taste.com.au and altered slightly. But I think it’s quite a traditional recipe. Love the idea behind this cake – I love the flavor combination of bananas and pineapple!